A Maryland firefighter battling a type of cancer firefighters are prone to get says he has only a few months to live unless a successful treatment is found. Jesse McCullough has Stage IV colorectal cancer, which has grown and spread. Firefighters are prone to because of the toxins they’re exposed to when fighting fires. 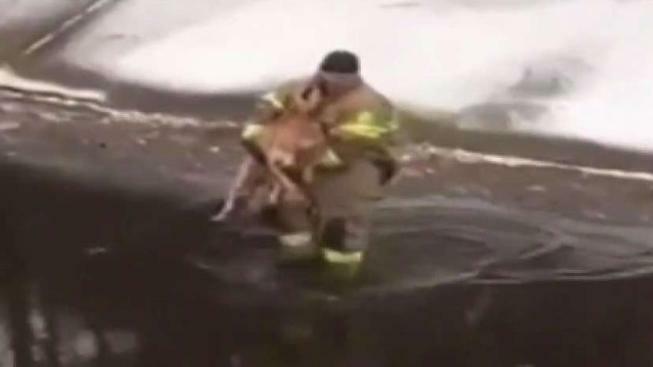 A 10-year firefighter and husband and father of two little girls, McCullough has continued working most of his shifts since his diagnosis in January 2017, including in December when he went into the water to save a dog stranded in a frozen ravine. U.S. Sen. Chris Van Hollen (D-Md.) announced the approval of a $2 million Firefighter Cancer Registry Thursday. It will create a national database to keep track of all the firefighter cancer cases. “That's going to be a big help, because we just haven't had the data to go to and to show the significance,” Barksdale said. Cancer is now the leading cause of death in the line of duty for firefighters, according to the International Association of Fire Fighters. It's a costly battle, and now McCullough's fire family is trying to help with that. “He's currently going through chemo at this time and looking for some other options because his cancer has progressed, so we just want to raise some extra money and take that burden off of them,” Hasan said. On Sunday, they are raising money for his treatment during a benefit featuring good food, raffles and lots of prayers for his future. “He still has hope that a miracle can happen, and he’s just going to keep on fighting,” Hasan said. Scientists hope to use the statistics from the Firefighter Cancer Registry to come up with solutions to minimize the risks for firefighters. Sunday’s benefit will be from 2 p.m. to 8 p.m. at the Pier Oyster Bar & Grill at 48 South River Road in Edgewater.